When there are conflicts in the workplace, with employees, customers or suppliers, or in the home and one or both parties take legal action against the other, settlement of the dispute is often tedious and expensive. In many situations, a mediator can provide a much faster, lower cost solution, with much less aggravation! Mediation is a confidential and structured process in which one or more mediators are engaged voluntarily by the parties who are in dispute, and where both are seeking an amicable settlement to the conflict. The mediator is independent and neutral, with no decision-making power; their role is to guide the parties through the mediation process. Every year, hundreds of thousands of business and personal conflicts end up in the UK courts. For many of these cases, the use of a mediator would be a real alternative. Mediation offers the possibility of reaching an out of court settlement to the dispute, in a more straight forward, speedier, and normally more amicable way. In commercial disputes, these latter two points are very important if the two parties wish to work with each other in the future. If the dispute involves customers or suppliers, employees or shareholders, a protracted and acrimonious process will damage morale in the business and often profitability too. The insurance industry increasingly requires policy-holders claiming for legal costs and medical negligence to use mediation prior to taking legal action. You enjoy an attractive level of income - in our experience, if you secure one new client per week, and are involved in 10 hours of paid mediation work each week, you will earn more than would be the case in an equivalent full-time employed role. 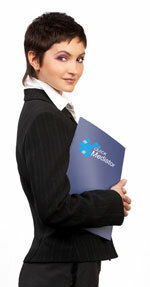 How much does a Quickmediator franchise cost?